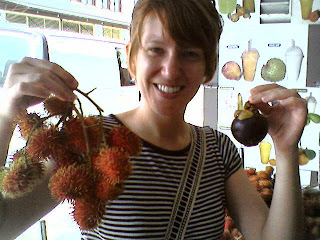 me with some of the beautiful fruit at a chinatown market. brian and i really enjoyed our trip to hawaii. we've been back now for almost two weeks--so it's certainly time to write it up. we got into honolulu after dark so it wasn't easy to get a good feel for how the island looked at first, but you could feel how it feels. 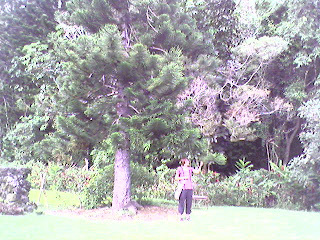 we were definitely in a tropical, humid place again. that night we spent the night in the cheapest waikiki hotel we could find and had our one and only night of bed rest on the trip. the next morning we got up pretty early and walked the couple blocks to the beach and had our first ocean swim. it felt good and wasn't crowded since it was about 8am. we even caught a few small waves. that morning we had our first taste of o'ahu birds too. we saw several kinds just on our walk to the beach. after checking out, we went over to chinatown in honolulu (our first of several trips there) and enjoyed walking through the district, seeing the leis and fruit for sale, and smelling the good-smelling foods and the not-so-good-smelling foods. i bought a black kukui nut necklace and we found a great in-door eating area with lots of asian-food vendors. i settled on a malaysian nasi-goreng. we had really wanted to get indonesian food while we were there, but the one indo restaurant had closed shortly before we arrived. anyway, the nasi goreng was basically indonesian food. we also bought a fair bit of fruit: a dragonfruit, chigos, and rambutans. (the dragonfruit is interesting looking, but doesn't have the best taste. the chigos though are a cross between a zapote and a pear, and we our favorite new fruit. after we came back, b found out that the chigos are actually related to the zapotes.) it was a really fun stop into chinatown. 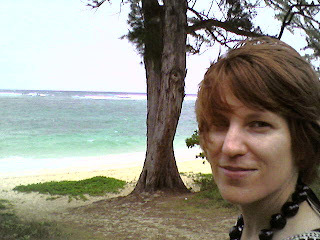 after that, we drove up the eastern side of the island to get to our campground. 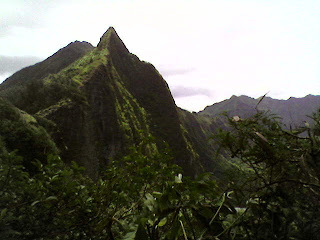 along the way, i got to see the ko'olaus for the first time (the eastern mountain range on the island). they absolutely beautiful. 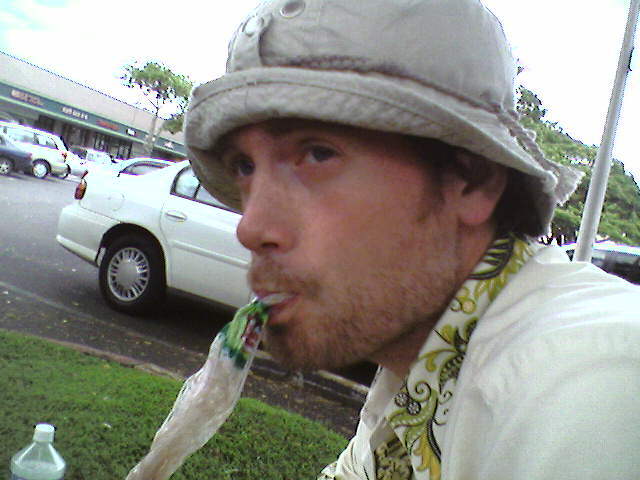 we also found a grocery store and bought some poi. we stopped at a beach park and mixed up our poi with milk, sugar, and poi. it was good to have again--it had been a long time since our last taste of poi. shortly thereafter we got settled into our campsite and then went swimming at the beach right next to the campground. the next day we wanted to ease ourselves back into the swing of snorkeling things, so we drove down to hanauma bay. we knew it would be crowded so we got there pretty early. the bay was beautiful--especially from the view up top (you walk down to the bay)--but it's sort-of funny to pay to snorkel there when there is better snorekeling (for free) on the island. but, it did help us reaccquaint ourselves with our gear and things. there were also a lot of fish and, of course, we saw our first sea turtle, which was really exciting. at this point, i'm not very good at remembering what we did which days. i could go back to my journal, but i think i'll just hit the highlights. so, hanauma bay wasn't our favorite snorkeling spot, shark's cove was. it was great there. we went there many times, and it never let us down. we always saw a lot of fish, we saw three sea turtles there (including one massive turtle that was at least three feet long), we saw several sting rays, and we saw an octopus. we also discovered that we can be in deep water and not freak out. i liked the feeling of being calm while the water was deep and we were (sort-of) far out. the next best snorkeling spot was waimea bay. snoreking there we saw a school of tuna, a school of squid, several eels, and lots of fish. waimea bay was also our favorite beach. it was beautiful--the setting, the blue water, the white church tower behind it, the big rocks jutting out into the water (that brian actually jumped from), and soft sand. it had it all. we kayaked out to a few islands off the shore from kailuah beach park. i've never kayaked before, so that was quite an experience. it was cool being so far out into the ocean. on the islands we saw the shearwaters nesting and could explore a bit in a place that felt more unchartered. we enjoyed exploring the island. we saw most of the island. we drove all along the eastern shoreline up to the end of the road and then through the middle to the western side and all around honolulu. the eastern side is the prettiest, but the western side was interesting too. that's where we had been warned about snorkeling. there are entire shantytowns of homeless along the beach on the western shoreline. it really is amazing how they have taken control of beach parks and some prime land. it's sad in some ways, but kind-of cool in others. a lot of the island is filled with tourists or people who have a fair bit of money. it's a fact of life that there's a flip-side to that, and maybe it can remind people that we need to care for the poor better. it was also comforting to me and b to see these people group together to form communities. it would be nice not to feel or be alone. while on the west side of the island we also (finally) found a road-side fruit stand with good prices. we bought 4 mangos and 2 guavas. they were a good deal and so delicious. brian said several times he wished we had bought more. the mangos were bright orange inside and so fresh in a way that i've never tasted in a mainland store-bought mango. we went for a hike in the ko'olaus and enjoyed the scenery. we also liked feeling like we were in lost tramping through the jungle. we went to a few thrift stores and found some good stuff. our best find was a chinese sand pot, which we had never heard of before, but is a type of ceramic cooking dish that's used by the chinese sometimes. it's a cool piece with metal wire adorning the sides. 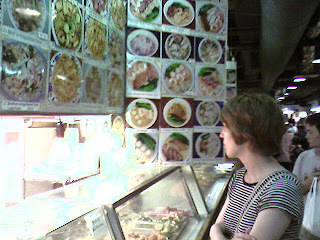 we enjoyed trying new foods there. one of my favorites was pani popo (a roll covered in coconut pudding), and we both really enjoyed kailua pork with poi. in fact, we made our own kailua pork (a la the oven) after we got home. it's really good, and actually really easy to make. i'd recommend giving it a whirl sometime. 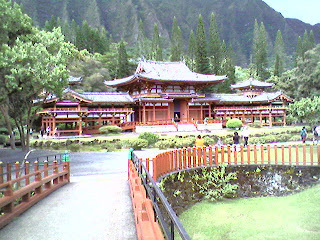 we went to the byodo-in temple nestled against the ko'olaus. it is a beautiful buddhist temple that's a recreation of an old temple in japan. that was one of my favorite non-beach stops. it was such a peaceful place, and you can't overstate how beautiful the cloud-covered ko'olaus are. oh my! we went to the pali lookout. 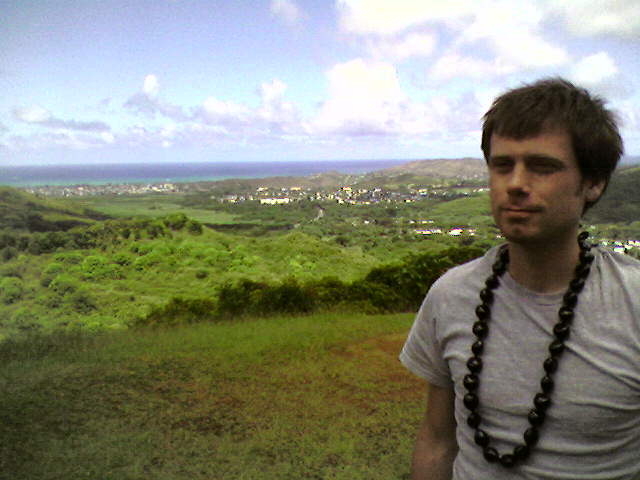 a place along the old pali highway that overlooks the mountains and the ocean. we walked along the old road and followed it to the place where brian remembered climbing up to a waterfall. the waterfall was still there, and it was a nice chance to be away from people and in the natural environment. along the walk down the road we also saw a hawaiian centipede. we went to all of the old places where brian lived in hawaii as a kid. we found his old townhouse in kailuah, and even his old school and the safeway his family used to shop at. it was neat to go around his townhouse neighborhood because he told me about things he remembered (many of them stories i've already heard), but showing me the actual place where such and such happened. that was fun. we also happened upon the faculty housing that he and his family first lived in when they moved to hawaii. while there, we also walked around the univ of hawaii campus some. he found the place where he and his dad once caught crawdads. and there were actually still crawdads there. 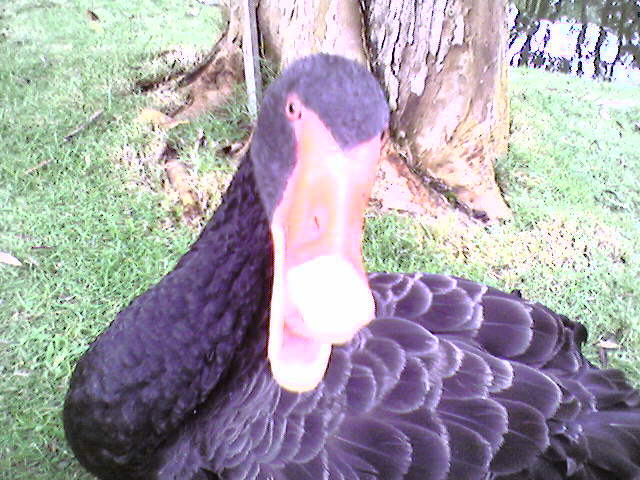 we did some good birding while we were there. brian had found a place in kailua we could go and we saw all of the main endangered birds on o'ahu. 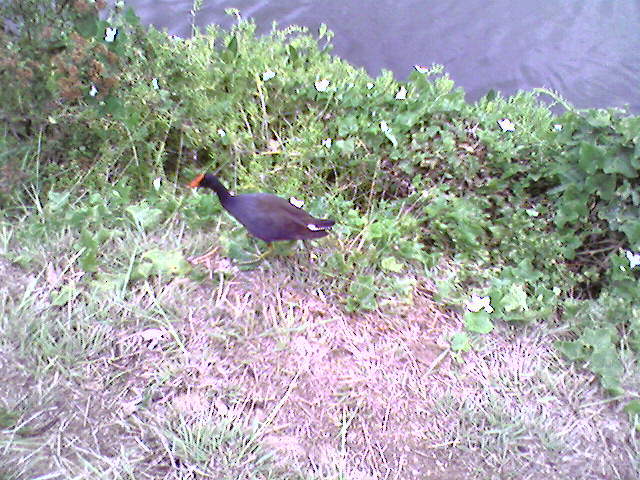 we saw the moorhen, the hawaiian coot, hawaiian stilt, black-crowned night heron, and the hawaiian duck. 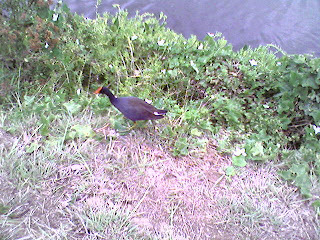 we also saw lots of other birds around the island. we were quite proud of our bird sitings. it helped that we had a birds of hawaii book. the only birds we didn't see that would have been cool were some of the creepers. ok, i think that's it for now--other than the pictures. brian seeing how close he could get to a swan at the byodo-in temple. about to order nasi goreng at the food court in chinatown. 4 goals in 1 game = 1 win! william had his first soccer game (for the new season) last night, and he scored 4 of his team's 5 points! and, beyond that, he finally knows how it feels to win a game. his team didn't win any games last season. unfortunately, i missed the game (i'm attending some education week classes), but i assume i'll see him score some more goals and win some more games. hopefully this will be the beginning of a beautiful relationship with the great game of soccer. it's been awhile ago now, but last month we went to yellowstone with all of brian's family except his youngest brother. brian and i hadn't been to the park since 2002, and william had never been. so it was really exciting to go. we saw lots of great animals and had some good adventures. the highlights for me were hiking the 5.5 miles down the canyon to the yellowstone river and then the river rafting excursion on the last day. being down at the yellowstone river though was, by far, my favorite thing. the river is amazing: powerful, clear, beautiful, and hypnotic. i've never seen a river that i've wanted to just wade into more than that one. it could put you into a trance looking into its depths. but, of course, you wouldn't want to go into it. at a minimum you'd be hurt badly. but you could die in that river--it's so strong. while we were down there, we fished. i thought that would be fun, it i didn't think it would so great. but, i was wrong. it was such a unique fishing experience, and we were catching a lot of those native cutthroat trouts. we couldn't keep them, but even the catch and release was fun. it was a new experience to pull in so many big fish out such a strong current. then there were other fun parts: seeing old faithful blow, seeing the old faithful inn, swimming in the firehole river, and seeing some new geysers. us at a beautiful waterfall in idaho. w fishing in yellowstone lake. w and naomi with their arrowheads. me and w with the yellowstone river behind us. w next to a geyser. b with one of his fine cutthroats. me with one of my fine trouts! me and brian on our way down to the yellowstone river.